The privately-owned German company Solarlux, which is a leading supplier of bi-folding glass doors, glass wintergardens and glass canopies, has made it its mission to create products designed to bring more natural light into indoor spaces, create healthier indoor living conditions and to set new trends for indoor living. This is why, when it came to building its new headquarters in Melle near Osnabrück, Solarlux's two managing directors, Stefan Holtgreife and Jörn Greve, made a point of making the new building as environmentally friendly as possible. The new Solarlux Campus has a size of approx. 45,000 square metres and was built using the company's own façade systems to create contemporary and modern offices. Set on using only sustainable materials in its new headquarters' construction, it was decided that the entire building was going to be built without the use of solvents and silicones. In order to stick to this principle when it came to laying the floors, Michael Borgelt (Fussbodentechnik Borgelt), the flooring installer, turned to our proven STAUF products for installing the new headquarters' solid wood floors. This emphasis on natural and sustainable materials is also reflected by the new building complex' architectural design, which makes it blend perfectly into its natural surroundings. Light-flooded and benefiting from natural air conditioning, the building provides its users with a healthy environment in which to work and a pleasant indoor climate. Thanks to its use of geothermal heating, cogeneration, heat recovery and photovoltaics, the new Solarlux Campus is a real showpiece of sustainable industrial design. Its 21-millimetre thick solid wooden floor boards, which were installed over an area measuring nearly 500 square metres in September 2016, were fitted by Michael Borgelt, a floor installer from Melle, Germany. To do so, Borgelt and his team spent a full three weeks on site, during which the crew installed the flooring in the Solarlux cafeteria, offices and meeting rooms. This was amidst an awful lot of other activities already taking place in the building, as some of Solarlux's staff were already working in some the new offices there, and other areas of the building's interior were still in the process of being finished off. This was in addition to the continuing work on the headquarters elaborate outdoor features, which include a gently sloping stairway, an exercise trail and pond - all of which are designed for use by Solarlux's staff as a recreational area. The 3000-square metre exhibition area, the heart of Solarlux's Campus, is full of installers. Using a forklift, part of the crew is busy fitting the perfectly circular, oversized lamps under this area's glass roof, which is intended to double up as an event space and has been equipped with an elaborate lighting and sound system for this purpose. While all of this is going on, Michael Borgelt finds himself faced with a completely different challenge next door. Which is that the concrete base on which the wooden flooring is to be installed is still quite fresh and uneven in places, hence calling for a particular kind of expertise" as the expert installer calls it. Using diamond grinders, Borgelt and his team consequently grind down bumps as high as two centimetres in some places before priming the base with two coats of STAUF VEP 195 solvent and water free 2-component epoxy primer and sprinkling it with quartz sand. Once the sand has been removed, the crew start pumping a thick layer of STAUF ES cement-based filling compound onto the prepared base. STAUF ES has been specially designed for floors subject to heavy use and is a very low emission compound. This layer is finished off with STAUF AS, a filling and levelling compound for making the subfloor more level still. Both of these compounds furthermore ensure that the subfloor will have a high level of absorbency. Last but not least, the installers fill any remaining gaps and cracks with STAUF RM repair mortar. The ready-prepared subfloor is subsequently covered with five-millimetre thick rubber heat and sound insulation matting, which is then coated with STAUF SPU 460 – a highly environmentally friendly and effective wood flooring adhesive with a high level of strength that is specially designed for this kind of flooring. This SPU adhesive also has an impressive range of environmentally friendly features: it does not contain any solvents, hazardous substances or isocyanates (i.e. is very user-friendly) and produces very low emissions – which is not only good news for the installers, but also for all of Solarlux staff and visitors. To finish, the surfaces are given a final sand down and sealed with natural oil. The final stage of the installation work involves fitting nearly 250 solid wooden steps, which is a very elaborate process. It involves priming the base again with STAUF VEP 195, which bonds materials extremely well, even on very damp surfaces. High-quality workmanship combined with adhesives, levelling compounds and other accessories manufactured by STAUF has long since enabled the flooring installation company Fussbodentechnik Borgelt over and again to deliver outstanding work in the area of floor installation in keeping with its tradition. 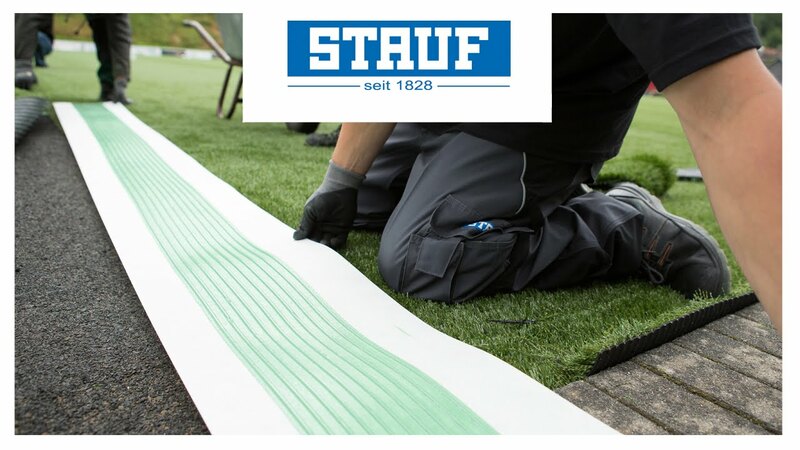 Founded more than 40 years ago in Melle by Borgelt's father, Borgelt proudly recounts that "We have always used STAUF products and that's part of our tradition and success." Today, the master flooring installer, joiner and interior designer is passing on his experience to his sons, who have both joined the company.